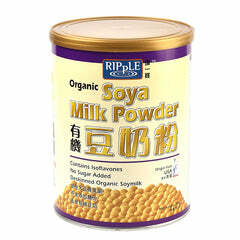 Tailor-made for one's health, Women’s Rejuvenation Soy Milk Powder uses American non-GMO organic soybeans. Peeling process of soybeans allows its essence to be retained to a large extent. The powder contains Collagen, Hyaluronic Acid, Water - soluble Fibers and minerals such as Iron and Calcium to provide integrated health care to both women and men. - Does not contain pesticides, gluten, preservatives, pigments, lactose. Collagen helps effectively promote the metabolism of skin cells and elasticity of skins, while Hyaluronic acid can contribute to moisture lock within the skin. Water-soluble fiber can be used to treat and prevent constipation which is essential for keeping your intestinal system running smoothly. Soy isoflavones contains phytoestrogens which helps to promote women’s wellness. Soy protein and lecithin aid weight control as well as reducing the risk of heart and blood vessel disease. Mix 3 teaspoons (25g) of soy milk beverage powder with 150ml warm water. Ingredients: organic soybean, collagen, calcium carbonate, water-soluble fiber, iron, vitamin C, hyaluronic acid & vitamin E.
Adult male and female who are concerned about physical health and well-being.